I am an anime fan. I'm not what you'd call an otaku--I do not eat, drink, breathe, or bathe in anime--but I enjoy me a good anime series or movie from time to time. However, as was discussed in my introduction to anime post and in the comments section there, it can be difficult and expensive to get a hold of anime if you don't have an otaku friend handy. The reason I don't watch a whole lot of anime today is, simply put, I just don't have the money to afford an otaku friend. 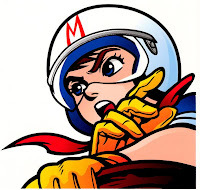 My first exposures to anime were almost certainly Speed Racer and Sailor Moon, long before I had any idea that Americans weren't the only ones who drew cartoons. I liked them well enough, but not as anything more than something to watch when there was nothing else on. That's how things remained until college, the formative time of my life where tens of thousands of dollars were spent on giving me an education in all the fandoms I had been missing out on up to that point. Seriously, I could have gotten a degree in Dungeons & Dragons. Alright, so of course I did more than just play videogames and DM and watch anime (seriously, Mom and Dad), but college was great because of the geek organizations I was able to be a part of; specifically, in this case, an Anime Society (because "Anime Club" implies far more dancing and karaoke than was actually a part of our nightlife). As any good anime organization should, twice a week the Anime Society took over one of the smaller campus auditoriums and played about five consecutive episodes of an anime series on the big projector screen there. Eventually I found it was easier for me to watch anime on my own time than try to work my busy schedule around the weekly meetings, but while I was an active member, I got to see a decent variety of anime, and I discovered a previously unrealized fandom. Heck, a few of my friends started doing anime showings of their own, and the school library had a pretty beefy library of anime titles, so I had more than enough opportunities to get my fix. As for post-college? Fuhgeddaboudit. With only my girlfriend's modest collection of not-usually-up-my-alley anime, the two series I actually plunked down money on at Otakon (specifically, Neon Genesis Evangelion and Panda-Z), a handful of Lupin III DVDs for cheap from the bargain bin at FYE, and a fairly recent gift of the first season of Black Lagoon to keep me going, I haven't been watching nearly as much anime as I used to. That's alright, though; as a casual anime fan, it's been enough for me to get my fix, and not constantly having an anime series going helps me to focus on other fandom-related endeavors. Such as sleeping. Hey, if I can be a fan of sleeping on Facebook, then it's a legitimate fandom, right? I suppose the entire point of this journal entry that I'm trying to pass off as a blog post is that, although I'm an anime fan, there's not a whole lot of anime-related material on this blog because everything I'd like to write about I watched too many years ago to remember fully, and most of the things I've watched recently either aren't things I care to write about, or else I'm not a big enough fan to do a post that'll do the anime justice. Because you know, as soon as I write about any anime I'm not a diehard fan of, a diehard fan will swoop in and lay the smack down about how I don't really understand the anime and how I totally failed to mention its sequel and the movie and the line of fully poseable action figures and the mail-order glow-in-the-dark spoon set. This will happen. But, hey, at least it'll get people commenting on the blog, so maybe I'll risk it one of these days and write about, oh, Evangelion. It'll be like explaining quantum physics with sock puppets. 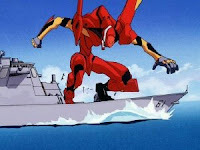 Evangelion is so 10 years ago... unless you want to watch the new movies. Truth be told, I think the vast majority of general anime fans and "otaku" out there procure their anime quickly and cheaply via illegal means... and spend whatever income they have on actual merchandise. And I suspect you're right about how most anime fans get their anime, but that's just not my style. It's actually, I think, pretty hard to write a relevant anime blog for anime fans without doing that; most places that write about anime are writing about the stuff that's out now and aired last night (for example, the new Suzumiya Haruhi anime). An interesting dilemma.